Beautiful story of how music brings peace. A squirrel eats half a pear and makes a violin from the other half. The music makes the fox stop chasing the chicken and the lion stop chasing the rabbit. When a seed falls from the pear, a pear tree sprouts, blossoms, and bears fruit -- so that the animals can make their own violins, violas, and cellos.Illustrated by Gumi (also from China).Starfish Bay PUblishing, 2016.No translator listed. To be honest, I picked this up because it had a squirrel on the cover. The story was cute, but not the greatest. 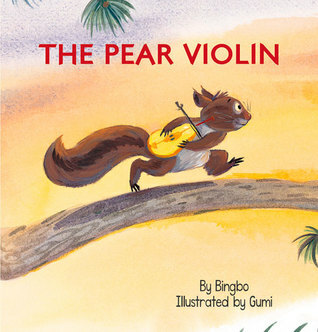 A cute book about a squirrel who makes a violin out of a pear. He's music is so calming to the other animals in the forest that everyone want one. Length makes it preschool or one on one.